The public transport network in Amsterdam is impressively convenient get around if you are familiar with it. The network includes metros, buses, trams, ferries and trains. There are a lot of different tickets to use Amsterdam’s public transport of which the public transport chip card (ov chipkaart), a card that lets you travel on credit, is the most common one. Other tickets range from one way tickets to multiple day tickets. We understand that all these tickets might confuse you, through this page we want to help visitors from all over the world to make the most of their stay whatever the length. If you are planning to stay in Amsterdam for a few days it is handy to buy separate tickets. Depending on your plans there are a lot of options. A GVB hour ticket allows you to travel with GVB for one hour, very handy when you are going to use the public transport a few times only. A GVB 2×1 hour ticket allows you to travel with GVB for two times one hour, very handy when you are going to use the public transport a few times only. 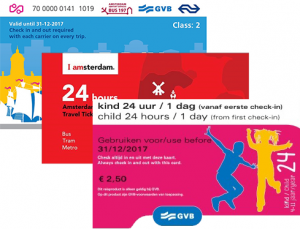 A GVB day ticket allows you to travel with GVB, the major carrier in Amsterdam centre, unlimited for 1,2,3,4,5 or 7 days. An Amsterdam travel ticket allows you to travel limitlessly with all carriers in and around Amsterdam, including from and to Schiphol, for 1, 2 or 3 days. The Amsterdam & Region travel ticket lets you travel in Amsterdam and it’s surroundings for 1, 2 or 3 days. With this ticket you can explore the beaches of Zandvoort, Edam’s cheese market, the Aalsmeer flower auction, Keukenhof Gardens and many other beautiful sights. The Holland travel ticket is a day ticket that can be used in all trains, buses, trams and metros in Holland. Furthermore there are day tickets for EBS an smaller carrier in the Amsterdam region. 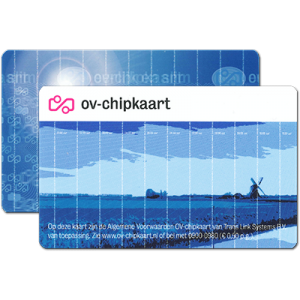 When you are staying in Amsterdam for more than 7 days it might be beneficial to buy a public transport chip card (ov chipkaart) instead of day tickets. With the public transport chipcard you only pay for the distance you actually travel, with a one way ticket you pay for the whole trip. The public transport chip card is a plastic card that lets you travel on credit. Travelling with a public transport chip card is very handy because it allows you to travel with all the carriers including the NS (Dutch railway). Customers can buy this card in our webshop for € 7,50. Customers can also load the card with credit before you arrive in Amsterdam. All of Amsterdam’s metro stations, operated by GVB, are gated with check-in and check-out ports that open with a public transport chip card or another travel ticket. The metro in Amsterdam is especially efficient to travel to the edges of the city. When exploring the city centre trams and buses are more convenient. The buses in Amsterdam are operated mainly by GVB, Connexxion and EBS operate bus lines around Amsterdam. All buses have check-in and check-out ports meaning that you can check in with a public transport chip card. 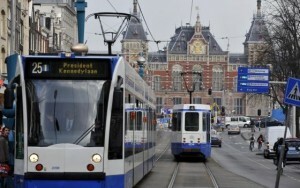 The tram is one of the most popular way of transportation in the city centre ofAmsterdam, the network is large and highly reliable. All trams are operated by GVB and you need a public transport chip card or another valid ticket, such as a GVB ticket or an Amsterdam travel ticket, to be able to travel. North Amsterdam is separated from the centre by a large canal called the IJ. The most convenient way of crossing this canal, both during the day and the night, is to take a ferry. Because there are a lot of ferries operating in a relatively short route you rarely have to wait more than a few minutes. Most of the ferries depart just outside the Amsterdam central station, other places to get on board are displayed below. The best thing about this service is that it is absolutely FREE! As of 9 July 2014 it is not possible to travel with standard paper tickets anymore, traveling using the railway network requires a public transport chip card or a one way ticket. Please not that in order to be able to travel by train the credit on your chip card must be at least 20,- euro. To avoid the hassle of buying a travel ticket seconds before departure it is possible to buy your ticket online. Are you visiting the Dam Square or rather the Anne Frank House? You will find the best must-sees on our Tourist Hotspots Amsterdam page. These hotspots are all accessible by tram, subway or bus. We have already figured out for you which public transport ticket you can use. View our Amsterdam Tourist Hotspots here.